The smallest organizational unit for which individual financial statements are created according to the relevant legal requirements. A company can include one or more company codes. The definition of the company organizational unit is optional. A company’s financial statements also form the basis of consolidated financial statements. All of the company codes within a company must use the same chart of accounts and fiscal year. However, each company code can have a different local currency. 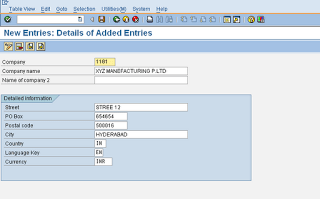 Give the required details as above screen shows. Now click save button and click on back button to go back to SPRO screen.